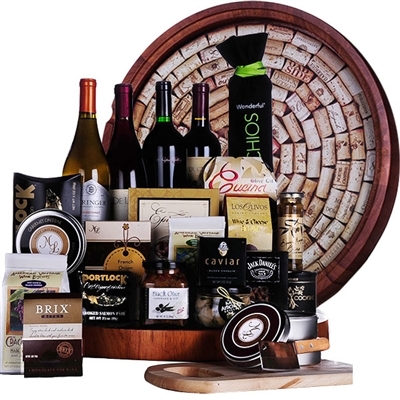 Celebrate any occasion with this ultimate wine, food and gift set. Our Wine Celebration Gift Basket is a beautiful combination of all things great! It begins with a cork saver tray that is made out of wood and has a piece of removable glass which enables you to save and display your corks in the tray. So to begin your cork saving journey we have included four bottles of quality California wines that will please any wine lovers palette. We have included a bottle of Beringer Chardonnay, DeLoach Pinot Noir, Wente Cabernet and a Duck Horn Merlot. To further your enjoyment we have hand selected our most popular gourmet items that pair beautifully with our California Wines. We begin with Three Cheese spreads, a Merlot, Cabernet and Chardonnay that go very nicely with the wines. We have also include a cutting board and cheese knife along with crackers, spreads, dips, Red and White wine biscuits, Portock Salmon, Caviar and Salmon Pate, Brix Chocolate, two wine glasses, and many more gourmet snacks!